Graphic novels are well-loved among the students at my elementary school. 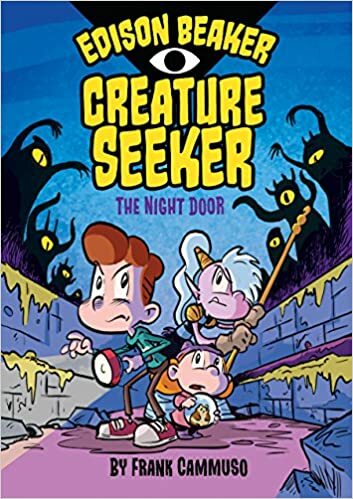 I predict Edison Beaker, Creature Seeker will become one of the graphic novel series that students, once they read, will be eagerly awaiting the next installment. While their mother is away, Edison and Tamika are in their uncle's care. Uncle Earl is an exterminator and when he has to make a late-night service call, he takes Edison and Tamika with him. Edison and Tamika learn that the family business their uncle is involved in has nothing to do with controlling the ordinary type of pests. Rather, he's protecting the world from the dark creatures behind the Night Door. Edison, who's skilled at finding things, needs to get back the Keystone that will seal the door shut again. Edison Beaker, Creature Seeker has everything many of my students have come to love in a graphic novel. It's adventurous and filled with action. There's funny moments, too. The heroes of the book are everyday kids who have extraordinary courage and the willingness to take huge risks to save the world. This is a graphic novel I can't wait to put on my classroom shelf. I just hope Book Two is in the works so my students don't have to wait too long to find out about Edison's next adventure. Thank you to Penguin Young Readers for providing me with a review copy of the book.